Harris: This is not a trial. You're here because you have the courage to do what you called your civic duty. Harris says it is significant that Ford came forward with her confidential allegations before Kavanaugh was nominated. Harris: You reached out to your representative to contact Trump before the nomination, that's extremely persuasive. You remember key, searing details of what happened to you. Harris: Studies show that shame and fear of consequences cause survivors to delay reporting. Harris: You passed a polygraph, Kavanaugh has not. 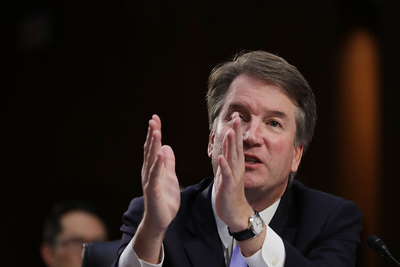 You called for witnesses to testify, Kavanaugh has not. You called for an independent FBi investigation into the facts, Kavanaugh has not. Harris: Contrary to what has been said today, the FBI does not present conclusions, it investigates and gathers the facts for this committee's consideration. Harris: It's been said this could have been investigated in July. It could also have been investigated in the past 11 days, but that has not happened. Harris: You are a true profile in courage at this moment in time. Mitchell: Did Leland ever follow up with you? Ford: She didn't know about the event. Ford: Leland has significant health challenges and I'm grateful she's taking care of herself. I don't expect PJ and Leland would remember this evening. It was an unremarkable party for them. Mr. Judge is a different story. Mitchell: Have you educated yourself on the best way to get to memory in terms of interviewing victims of trauma? Mitchell: Would you believe me if I told you that no study said this procedure in five minute increments is the best way to do this? Mitchell: Instead you were advised to get an attorney and take a polygraph. Mitchell: Instead of an interview in California, we're having a hearing today in five-minute increments. Ford: I agree that was what was agreed to collegially. Senators introducing letters into the record. Feinstein: I hope majority would ask Judge to come forward. Blumenthal: If you are introducing statements from individuals, I would submit we should have those people testify. I would object to their statements being submitted to the record. Grassley: Thank you for your testimony and your bravery coming out and trying to answer our questions as best as you can remember. We are recessed for 45 minutes. Mitchell moved over to the witness table to shake hands with Ford. Is the next session for Kavanaugh? Will Mitchell be asking Kavanaugh questions as well? If they vote Kavanaugh in tomorrow, how soon would he be seated? Judge Kavanaugh is approaching the hearing room, with his wife Ashley. We are going to get started again in a moment. White House Counsel Don McGahn is in the front row of the audience, as he was during the previous four days of Kavanaugh's hearing. White House Counsel Don McGahn has just taken a seat in the front row. Judge Kavanaugh just took his seat. Grassley is explaining the statements of witnesses mentioned by Ford denying any knowledge of the gathering. He entered those into the record. He says minority said inappropriate to have these follow-up calls before FBI did its investigation, and blames Feinstein for not joining in calls. Kavanaugh just took the oath. He is starting his opening statement. Kavanaugh: Thank you for allowing me to make my statement. I wrote it last night. Nobody saw it except for a former law clerk. It is my statement. Kavanaugh: I denied the allegation immediately, categorically, and unequivocally. Here's the text of Kavanaugh's opening statement, via Politico. Kavanaugh quoting from statement of Ford's friend who Ford said was at the party. The friend denies knowing Kavanaugh.